Yes it can be done, but it is not easy, cheap, or without risks. 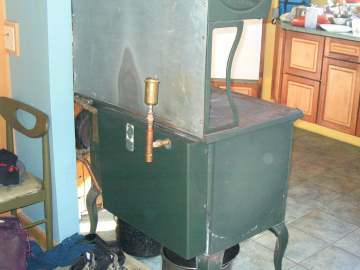 As oil, gas and electricity prices rise, we get more mail here at woodheat.org asking about heating water with wood stoves. This is a complicated issue and, while we understand the interest and have some relevant experience, we don't want to mislead anyone. With that in mind, please note that this is not intended to be seminar on how to go about heating water with your wood stove. In-floor radiant heating systems are all the rage these days because of highly successful marketing campaigns by equipment suppliers. The first thing that needs to be said is that a retro-fitted wood stove is not the right device for heating water for in-floor radiant. You would never get enough heat off a wood stove to make a dent in radiant heating needs. If you are lucky, you'll get enough domestic hot water (DHW) for your washing needs. In Europe there are some space heaters that are designed to be partly boilers, and these could be effective, but we have not seen similar products in North America. Our advice is to forget about trying to heat remote spaces with the heat you can take from a wood stove. Now let's get on with our discussion of DHW systems. A cautionary tale from one of our correspondents. In this case the pressure had somewhere to go. Without a place to expand the resulting explosion could cause injury or death. We have assembled five examples of DHW systems to give you an idea of optional approaches and how they work. This first example shows the consequences of bad system design and operation. 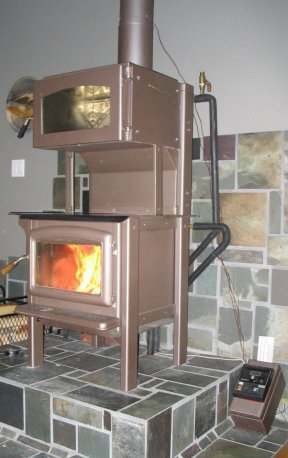 The photo at right and the one below it are of a cook stove that blew up in the Fall of 2005 in Prince Edward Island, Canada. At right you can see that the firebox/ash box section has blown apart from the oven section. This illustrates what happens when water turns to steam and has nowhere to expand to. The DHW collector in this case was a cast iron box fitted into the firebox, and offered as an accessory by the stove manufacturer. 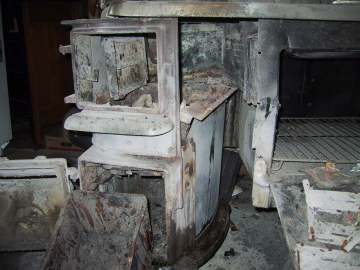 Front view of a cook stove showing the firebox blown away from the oven. The photo at right shows why the collector exploded. The red arrows point to the closed ball valves on the supply and return pipes to the collector. As we understand the case, the new tenants built their first fire of the season without knowing to open the ball valves first. This explosion would not have happened if the system had been designed correctly by locating a pressure-relief device between the collector and any ball valve or other shut-off. Also, wood fired DHW systems should never be in rental housing, in our opinion. 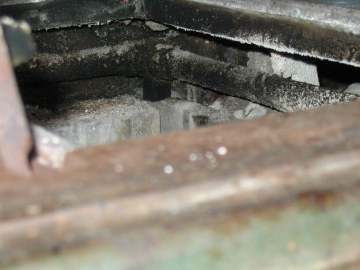 A look behind the stove showing the cause of the explosion: closed ball valves. Here is a series of three photos of a neat and effective installation on another cook stove, a Heartland Sweetheart. This one is in a new off-grid, straw bale house. At right are the pipes from the storage tank to and from the DHW collector in the stove. This is a gravity convection system in which water heated in the collector rises by convection to a storage tank mounted above. That is why the installer used 3/4" pipe and 45 degree elbows throughout. The water pipes to and from the collector and hot water tank. This is what the collector looks like in the stove firebox. Having the collector in the firebox does affect combustion by cooling the fire. Normally taking a lot of heat out of the firebox this way is not a good idea because it can lead to smoky fires and too much creosote. 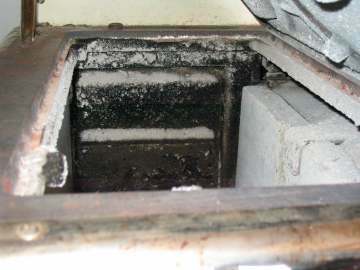 However, notice that the brick firebox liner is light in color, suggesting that combustion was hot and relatively clean. The user of this stove knows that it must be run hot to avoid creosote. She never turns the stove down much or attempts to have it burn all night. Luckily, her house is so energy efficient that short, hot fires are really all she needs to keep the small house warm. The collector tucked at the back of the firebox. Here is a shot of the tidy plumbing installation in the utility room behind the stove installation (taken while lying on my back). The blue thing sitting on the shelf is the pressure tank and the white thing above it is the hot water storage tank. This is how a slick convection flow system should look. The tidy installation behind the wall in the utility room. This shows good planning and installation. Here is the back of a Waterford Stanley cook stove with a custom made collector, shown in the next photo. The brass device on a tee off the outgoing pipe is an automatic air bleeder. 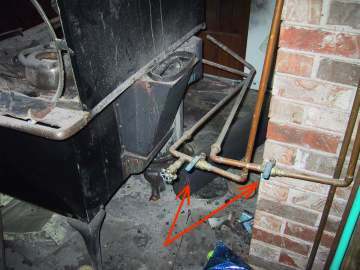 The supply and return pipes to the collector are tucked behind the stove's rear shield and are barely visible exiting it at the left of the stove. The piping at the back of a cook stove. Here is a shot of the custom collector in the stove above. It is made from stainless steel hydraulic pipe and fittings and is routed around the top edge of the firebox. It works fine, although because it is all horizontal, there is usually some boiling (resulting in thumping and gurgling) in it when a fire is first lit and the convection current has not yet developed. Once the current starts to flow, the system functions well and produces a lot of hot water. The collector does chill the flames so the fire burns dirtier than it would without it. This type of collector can chill the flames and lead to smoky fires and creosote. Here is a custom collector in the form of a stainless steel tank with a 1" thickness for water flow and a 6" diameter hole through the center. The tank takes the place of the first length of flue pipe. The collector is insulated and wrapped with sheet metal painted black. This system is actually oversized for this single person household and small (20 gal.) water storage tank. This collector is 36" tall. To reduce its heat output, a liner was installed inside the collector to isolate the flue gases from its inner surface. A 24" collector would have been better. 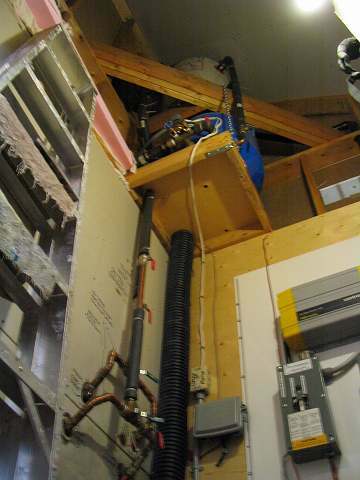 This experiment showed that a flue pipe mounted collector like this is effective. One caution, however: This type of collector should only be used on clean burning (EPA cert.) non-catalytic stoves connected to straight or nearly straight venting systems. This type of collector takes a lot of heat from the flue gases and could cause serious problems for a system using a dirty stove and a bad chimney, like an outside masonry. This collector is very effective, but takes a lot of heat from the flue gases. Here is a custom stove with a custom DHW collector. The collector is a flat (1" deep) reinforced stainless steel box that covers the entire back of the stove from the firebox exit to the top of the oven. It is bolted to the back of the stove, so the collector is not exposed to flue gases as is the example above. As a result, even though it is about the same surface area, it produces a lot less hot water. However, it does produce enough DHW for this two-person household under most winter conditions. This system depends on a pump because the storage tank is in the basement below. Both this system and the one above have the advantage of not affecting combustion because the collectors are outside the combustion zone. Note the pressure relief valve at the top exit from the collector. The valve should be plumbed down to a drain. 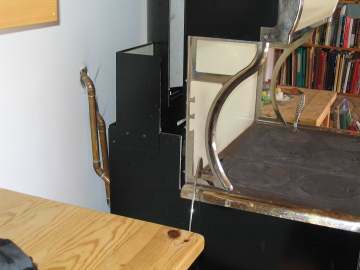 This stove has a large, flat collector bolted to the back of the firebox and oven. 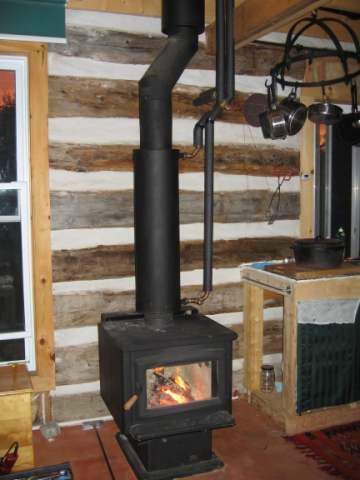 Here are some key issues to consider before installing a DHW system on your wood stove. There are major insurance consequences with wood heated DHW. For example, we don't know of any insurance company that will cover custom systems like the last three above. We suspect many insurance companies would refuse coverage to any wood heated DHW system, except, perhaps, ones that are inside boilers. Ironically, the first one profiled here (the blowup) would probably be approved by an insurance inspector because it had a collector that was certified for use with the stove. Before starting work on your DHW system, it is a good idea to check with your insurance company. The biggest obstacle to adding DHW systems to wood stoves is that EPA emissions certification virtually eliminates the possibility of taking heat directly from the stove. Any DHW collector that robs heat from the combustion process would almost certainly create a dirty burn that would fail the stove. That is why most manufacturers of EPA certified wood stoves don't offer DHW collectors as optional accessories. There may be one or two available, but we are aware of none at all. The best prospect for retrofit DHW systems would be flue pipe-mounted collectors like the second-to-last example. That collector would not affect combustion and its installation does not involve alterations to the stove. We know of only one such commercial example, but because the product does not appear highly developed and the advertising of it suggests that the manufacturer is not well-informed, we are reluctant to recommend it. Perhaps this situation will change in the future as more people request DHW accessories.